I departed London on September 29th for Delhi, meeting up with Indrajit Sengupta of Saving Tiger Society the next morning. We stayed in Delhi overnight before our flight to Jabalpur in Madhya Pradesh the next morning, our flight was delayed by two hours and the flight took an hour and half. We were met by a car at the airport and the drive was around 250 kms and took five and half hours to Karnavati rest house in Panna. Next morning, a forest department vehicle picked us up and took us to a school approximately 100 kms away, the forest department had organised a nature awareness event, as part of Wildlife Awareness Week. We were asked if Indrajit and I would give a short speech, which we did, there were talks given also by the forest department, head teacher, also having a quiz on wildlife and Tiger in Madhya Pradesh, which the children engaged in very well. In the afternoon, we attended a workshop with forest staff, on sharing their work experiences in the field, so that others might benefit, also watching video of how they had tranquilised two Tiger and relocated them, also rescuing a cub from cave after mother had abandoned it. There was also video of a sloth bear caught in a trap, with it mother also there, they rescued it and released it back into forest with mother at the same location. After the end of the workshop, we went for a visit into the park, we observed a female Leopard, chital, sambar and just before leaving the forest area, a python crossing the road. 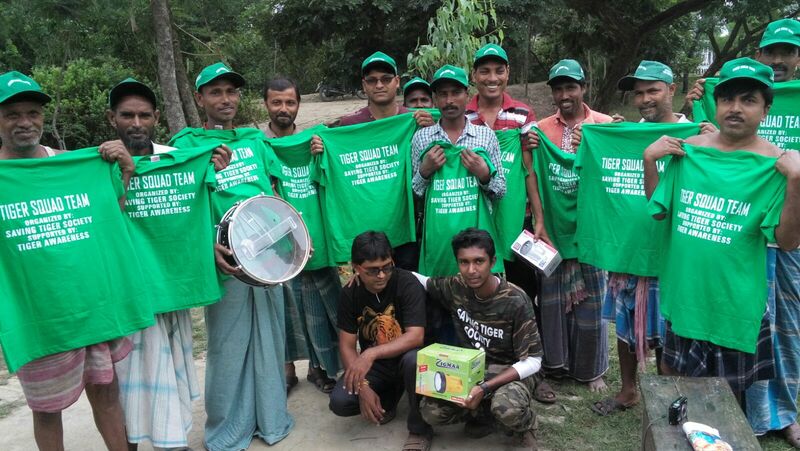 In the late evening, two of the Saving Tiger Society team arrived, they had travelled from Kolkata to Nagpur by train with the solar lights and cameras that we were to give to the forest staff tomorrow, and they had been picked up by a forest department vehicle, which was very helpful. Next morning, we were up early, to visit Panna National Park area, we visited Mandla area, whilst driving round, we bumped into a team from Wildlife Institute of India ( WII), who were monitoring a Tigress called T1 and she is pregnant, there are officially 32 Tiger in Panna. 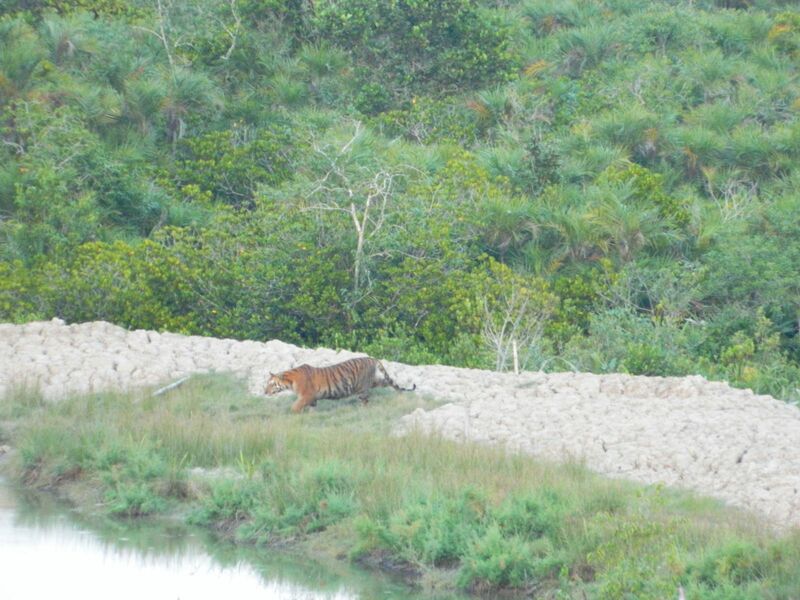 The team are using telemetry to monitor her, as she has a collar on, this helps to know, where the Tiger is, also allowing to them act, should they get to near villages, she was in the bushes about 15 – 20 metres away, there was also fresh pugmarks on the track in the area, though we did not see her physically. 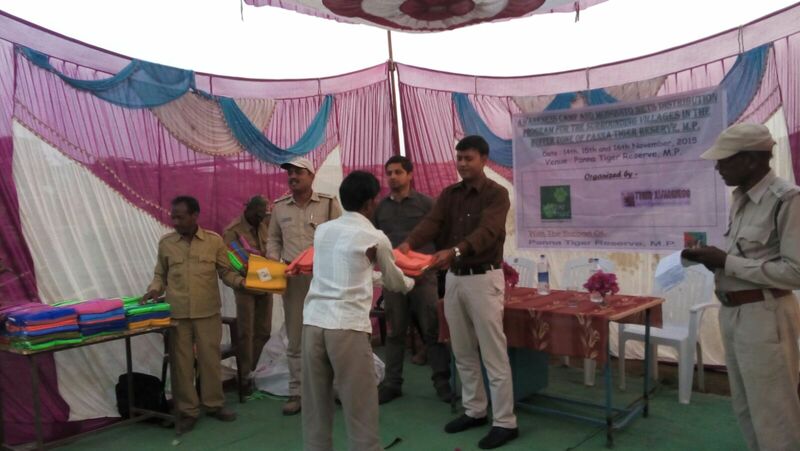 After getting back from the forest area, we had a presentation program of the 160 solar lights which are for the 80 anti-poaching camps and 10 digital cameras, which are for the Tiger monitoring teams in Panna, we gave the items at the place where we were staying at the Karnavati Interpretation Centre. After we have donated the items, in the afternoon, we attended more of the workshop which had been continuing from yesterday, learning more about Flaura and Fauna, we also after had the chance of a short visit inside the park area before it became dark. Next morning, we visited Ken Gharial Wildlife Sanctuary, it took us about an hour to get there and we had a short boat ride. After our return from the wildlife sanctuary, we had a long car ride to Pench Tiger Reserve, the journey is over 500 kms and it took us over 10 hours with a short stop on the way, we arrived around midnight, at the Pench Interpretation Centre at Turia Gate, as Saving Tiger Society team were to give a two day advanced snake training to forest staff here, also give snake handling kits to five forest beat areas, we had supported the work. Next day, the snake training started, there were thirty forest officers who attended and they had snake identification in the classroom, the second day was putting it into practice to catch a snake safely and also a test. We had lunch with the local range officer, he showed us a camera trap he had adapted to use a solar panel instead of batteries, to use a solar panel, as long as they are placed in a place with some direct sunlight, will save on batteries and man hours in going around the forest changing batteries and the cost is approx 450 to 500 Rupees, it is something we could look to help in the future. In the afternoon, the snake training continued in the classroom. Next day, the second day of the training took place, there was practical handling and rescue of snakes for all involved, my self-included, also present today was the Mr Shukla the Chief Conservator of Forest for Pench, he took part also in the practical handling. After the practical side, there was a test for everyone, we had also agreed to give as an incentive, that the top five, would get a pair of new boots, which would be helpful for their work. All taking part also received a certificate for their training. After the training, we had the chance to visit the park area, we also had the opportunity to visit Chandamathi fishing patrol beat camp, where there is a lot of illegal fishing, and also poachers are believed to come via this area. We had the chance to go out on their patrol boat, there was only about 7 – 8 boats on the water at this time, part is in Madhya Pradesh and the rest in Maharashtra, the forest department need a lot of support in this area, one way I have suggested would be to have a security / tracking dog in the area, whilst we were there, three boats went to the camp were the patrol boat is and did not like that there was some publicity / tourists people in the area and they abused a couple of the forest staff, they were young lads and drunk. After visiting the camp area, on our way back to our rest house, we observed wild dogs ( Dhole ) for about five minutes. further in the area in the future, he left us to continue to explain more in detail, to two of his staff, who had more experience of the area. We explained, that we would like to help with support, such as Snake training, medical check-ups for forest staff initially and then continue to build the relationship forward. 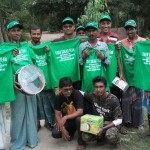 In the afternoon, we were to visit two schools in Damna area, to give wildlife /awareness talks with a drawing competition and prizes for the three best judged drawings, also giving some drinks and glucose biscuits, this had been arrange by a local Ngo that I know, called Global Tiger Conservation Society. 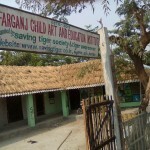 One of the classrooms we observed was in need of repair, the roof and floor needed attention, there was apparently funding from the local government to fix it, though it had not reached the school as of yet, we asked Global Tiger Conservation Society to monitor the situation, if the funds had not arrived by year end, then we would look to help in 2016, approx. cost 20,000 Rupees (£200), we would also look to get some new mats or benches for them children to sit on, rather than the old piece of scraggy hessian cloth they had to sit on. 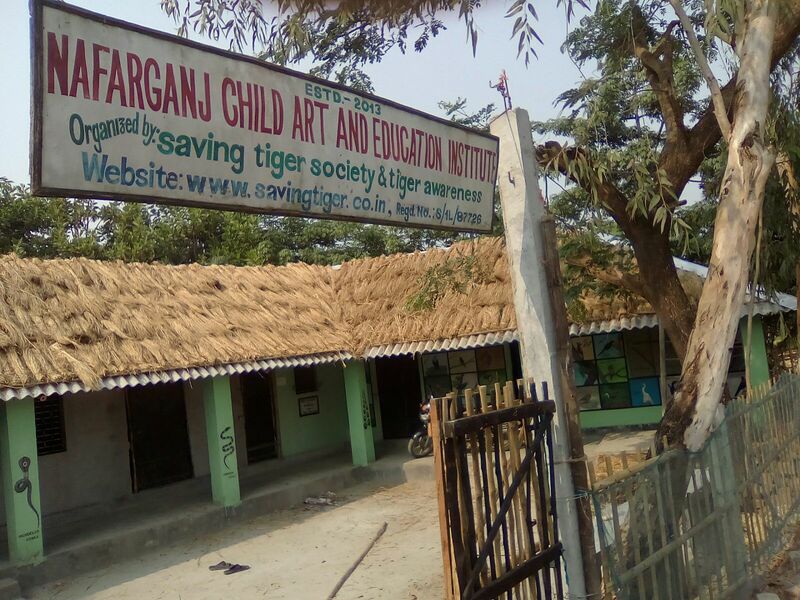 Next morning, we visited another school, this was in Bijariya to give nature/ wildlife awareness talk, together with a drawing competition, this time we also gave Tiger t-shirts purchased locally as prizes for the top six best judged drawings and a lunch box. In the afternoon, we visited Tala forest area again, we observed wild boar, chital, sambar, langurs, though no physical sighting of Tiger. Next morning, we met up with Deepak Talan, the coordinator at ground level for the snare removal project in the buffer area of Bandhavgarh. 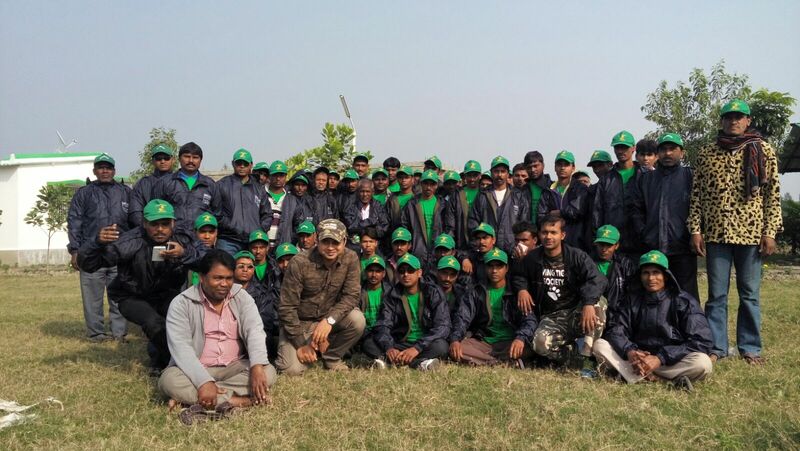 This is run by Tigers4Ever and Tiger Awareness has collaborated with this project in funding partnership, as many of 60 percent of Tigers / wildlife lose their lives to snares in buffer areas around national parks, we also met the trainer of the team. 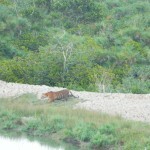 The project had been in operation for the last couple of months, Deepak mentioned, due to there being a new Field Director in place, that the project had been put on hold for a couple of weeks, so that he could do all his checks from his side, the previous Field Director had given written permission to Tigers4Ever to take this project forward also. After our meeting, we took a car to Kanha National Park, were we would spend the next two and a half days, the car journey took five and half hours, with a short stop for some tea. We were staying at a forest rest house at Kisli Gate. On arrival, we had a short meeting with a forest officer that Indrajit knew, discussing ways that we could look to help in the future. Next morning at 6 am, we went for a visit into the forest area, ( Mukhi Area), the vehicles drive at a sensible speed, not rushing about at mad speeds like in some forest areas. After forty minutes, we observed a male Tiger, he had a radio collar on, ten minutes later we heard a sambar alarm call, also a Tiger vocalising Aooowm, Aooowm, about 100 metres inside the forest canopy, though we did not get to see him. After a short toilet stop, we observed a small pack of wild dog ( Dhole), they were very playful and came very close to our vehicle. We moved on, after a further five minutes as we went around a bend, there was huge male Tiger walking towards us, he stopped, scrapped his feet, had yawn, then went into the forest cover. On the way back to the gate leaving area, we observed a couple more wild dogs ( Dhole ), also chital, Barrasingha, langurs and a couple of jackals. Next morning, our last visit in Kanha, we observed a male Tiger, gaur, and had been seven years since I had visited Kanha. In the afternoon, we had a constructive meeting with the Filed Director in Mandla, how we might be able to help in the future.Next day, we had a flight from Jabalpur to Delhi, then next morning Indrajit had a flight back to Kolkata and I had changed my flight back to UK a day earlier, rather than staying in Delhi for the extra day. The visit had been very busy, we had supported forest staff with equipment, and training also the forest staff had been very open and supportive in our meetings for now and the future. 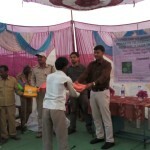 We have also put together programs to help in local communities and forest staff in Madhya Pradesh in the near future.